Shin splints are a common injury for runners. They can also be known as medial tibial stress syndrome (MTSS). Symptoms include pain in the front of your lower leg and at times along the inside of the lower leg, next to the shin bone (tibia). 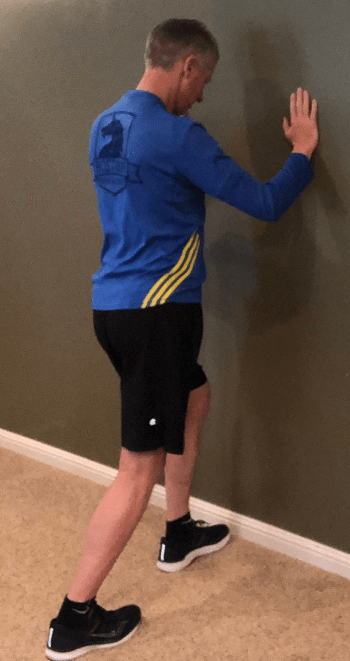 Because shin splints are very common and often discourage new runners from continuing to train, I have put together this comprehensive resource which not only explains symptoms and causes of shin splints, but most important, treatment and prevention. Self diagnosis of any sporting injury is dangerous. Every injury is different in some way and each requires specific assessment and treatment. It would be irresponsible of me as a certified coach to attempt to manage your injury in an article. So use the following information for guidance. Although I provide much researched details along with a logical and effective rehab program, I encourage athletes to seek professional medical opinion for diagnosis and to confirm treatment protocol for any injuries. The role of the shin bone during running is to help absorb and dissipate the impact generated with each foot fall. Shin splints are generally an overuse injury that occur when too much stress is put on the tibia or when the muscles next to and around the tibia are overworked. In healthy runners, the stress a bone experiences after a long, hard run is not a problem and doesn’t result in shin pain. However, in less experienced runners or athletes who have a muscle imbalance with weak shin muscles and underdeveloped hip abductors & calves, the shin bone has not yet adapted to the stresses of a high-impact activity like running. Unfortunately, shin splints often recur with many runners who aren’t able to address their overall weaknesses. This is because, many resources on how to get rid of shin splints (even from trusted medical sources) don’t address the root cause of the problem. The biggest risk factors for shin splints is a rapid increase in mileage or intensity of your running activities, such as a big increase in mileage or over-training on hills or hard/uneven surfaces. However, in order for these risk factors to lead to shin splints a pre-existing muscle imbalance between quads and hamstrings or weak shin muscles and underdeveloped hip abductors & calves will often lead to shin splints. Other factors include inadequate footwear, poor bio-mechanics such as over-pronation, flat feet or high arches. Each of these risk factors contributes shin splints. In a recent study of high school runners, a significant relationship was found between Body Mass Index, internal hip rotation angle and shin splints in females, and between limited single leg raise and stress fractures in males. This would support the need for strengthening and stretching exercises which are discussed below. Shin splints result in pain in the front of the outer leg below the knee. Typically this pain is located on the outer edge of the mid region of the leg next to the shinbone (tibia). In my experience dealing with runner’s with shin splints, they complain about discomfort in an area of their leg that’s anywhere from 4-6 inches in length (as opposed to a stress fracture which is typically pain in a much smaller area). 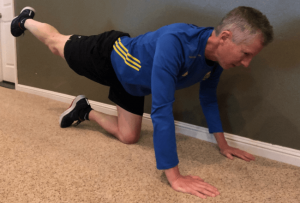 Oftentimes, the pain the runner is experiencing is at the beginning of the workout, then gradually lessens, but then can reappear at the end of the training session. Most people describe shin splint discomfort as a dull ache at first. However, as the trauma continues, it’s not uncommon for the pain to become so unbearable that it causes the athlete to stop their workout altogether. There are many articles regarding treatment of shin splints. The aim of most “traditional” treatment methods involved rest & ice, which typically reduced the pain. Medical studies of shin splints have attempted to confirm the most effective treatment, but no study is conclusive. 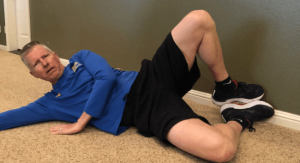 The proper progression of treatment and along with a planned exercise program will help alleviate the pain and most important prevent shin splints from recurring. First, I strongly suggest getting a diagnosis from a medical professional. We must confirm that the trauma is actually due to shin splints and not a stress fracture. There’s a big difference between the two injuries, especially in the treatment and length of recovery. Assuming that the injury is shin splints, first order of business is to minimize the pain. Rest – avoid activities that cause the pain or discomfort. However, don’t give up on all physical activity. Try low impact exercises like elliptical, swimming or stationary bike. Ice – apply ice packs to the affected shin for 20 minutes at a time 2-3 times per day. If the pain persists when you’re not engaged in physical activity, consider taking an over-the-counter pain reliever of your choice. Discuss your best options with a medical professional. In parallel to the above pain relieving regime, preventing shin splints involves a program of stretching and strengthening. Improving calf strength, abductor strength and strengthening shin & hip muscles are the best approach to preventing shin splints. The calves are the largest muscle group in the lower leg, when we strengthen them along with hips and shin muscles, we help stabilize the tibia with each impact. Regularly stretch your calves and hamstrings. 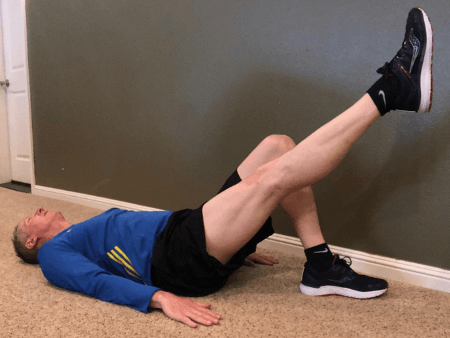 Use the stretching routine below to help avoid tight muscles in your leg that can put you at greater risk for shin splints and other lower leg injuries. Avoid sudden increases in physical activity. Gradually increase your weekly mileage & the intensity of your workouts. The rule of thumb for most runner’s is to limit weekly mileage increases to 10%. More experienced runners can increase by slightly more, but it’s always best to err on the conservative side. It’s also very important to ensure proper recovery after long & hard runs. This not only includes spreading out days between hard activities, but also completing alternate forms of exercise (like elliptical, stationary bike and swimming). It’s also really important to run slow on your easy days. Bottomline, getting sufficient rest will ensure proper recovery and help to avoid injuries. Run on softer surfaces whenever possible. This tip isn’t just for runners that are experiencing shin splints. It’s a good idea to try to minimize running too often on hard surfaces, such as concrete (sidewalks & bike paths). These hard surfaces over time will increase the amount of force that your bones and muscles have to absorb which can cause muscle fatigue and overuse and ultimately possibly result in shin splints. Choose soft surfaces like dirt, grass and synthetic tracks. Make it a goal to go for a weekly run on a nice wooded trail to break up the monotony of running on surface streets. This will help to prevent your bones, muscles, tendons and joints from having to absorb so much shock. Complete exercises that will strengthen your foot, ankles and the arch of your foot. The arch of your foot forms by the time you are 7 to 8 years old. Injury, age, and other health conditions can alter the structure of the arch; lack of physical activity can actually create weakness in the muscles of the foot, lower leg, thigh, and trunk. These changes can affect your lower leg and is often why beginner runners experience shin splints. Strengthening your foot important. An excellent exercise is using your toes to pull a towel on the floor closer to your foot while sitting. This helps to strengthen the arch muscles. Stronger arch muscles ensure the arch works more effectively. Foot orthotics (ie, arch supports) may be prescribed by your doctor or physical therapist if you pronate or require additional support for low arches. Alternatively, orthotics help with high arches by helping the foot absorb more shock and decrease stress.The use of orthotics should be prescribed by a medical professional. Strengthening your hip muscles will help your legs absorb more of the shock and pressure during running. Below are some excellent exercises that will help. Ensure you are wearing running shoes that are right for you. Shoes that don’t fit right or that lack proper features can contribute to shin splints. Speak with your physical therapist about the right shoe features for you. I also recommend rotating your running shoes. One strategy is to rotate your shoes. This means having 2 pair of the same or slightly different shoes and use them each 3 – 4 times per week. It’s essential to regularly replace worn running shoes. Typically replacement is recommended every 350 to 500 miles (560 to 800 kilometers). You can find a detailed article discussing how to buy new running shoes. It’s a quick, but informative read that will help you get the appropriate shoes to accommodate your gait and size. Increased body weight, being overweight, or obesity can lead to a higher risk of shin splints. Even if you if you run or exercise regularly, you should still regularly consume a well balanced diet. You can find some suggestions about How To Improve Your Diet Right Now. Have your running technique analyzed and corrected by a physical therapist. A formal video analysis of your running technique can help to identify movement patterns that can contribute to shin splints or other injuries. In many cases, a slight change in your running can help decrease your risk. So now that we know all this information about the cause of shin splints, it’s essential to develop a routine to prevent them. Below is a recommended strength training program. The exercises shown will strengthen and stabilize your legs, ankles, hips and core. They will help prepare your legs and body to deal with the high-impact of running. Start by lying on your side, legs stacked on top of each other with your knees bent at around 45 degrees and pulled slightly behind you. Put your bottom hand under your ear to support your head or along the floor and use the upper hand to push into the ground right in front of your chest. Keep your heels together, slowly open and close your upper knee up and down. Switch sides and repeat, opening out the opposite leg for the same amount of reps.
Clams help to maintain hip flexibility and provide knee stability. The small controlled movements activate all the small muscle groups in your glutes and inner legs to improve strength and range of motion without any impact. Stand approximately 18 inches from a wall with both feet shoulder-width apart, toes pointed inward. 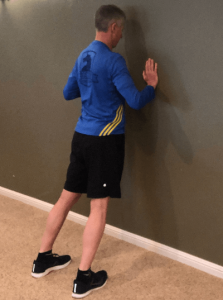 Press your pelvis to the wall, adjusting the distance from the wall and the angle of the toes to gain the best stretch of the soleus muscle. Keep your heels on the floor. Hold stretch for 15 – 30 seconds and repeat. 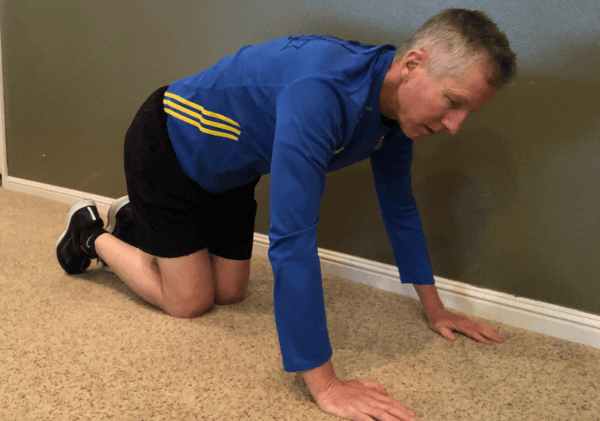 Get on all fours with your hands under shoulders and knees under hips. Keep right knee bent 90 degrees, flex right foot and lift knee to hip level. Lower knee without touching floor and lift again. Complete 15 reps. 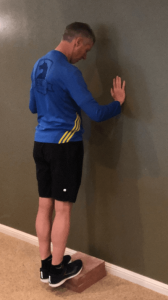 Stand, facing a wall with one leg extended backward, foot planted on the ground. The other leg, flexed at the knee, has the foot planted on the ground straight down from the hip. Arms are extended forward at upper chest height, shoulder width apart. Hands are placed on the wall. Press gently into the wall and gradually press your heel of the extended leg into the floor. A stretch should be felt through the length of the calf muscle. Stretch statically for 15-30 seconds, repeat multiple times and then switch legs after every rep. Runners with either neutral or underpronoted biomechanics often suffer from tight calf muscles. This stretch will help to alleviate the pain associated with recurring calf injuries. This stretch will also help to prevent calf injuries by keeping the calf muscle supple. Stand with both feet on a step with the heels off the step. Hands are pressed against the wall in front. Lower gradually to full extension (dorsiflexed). 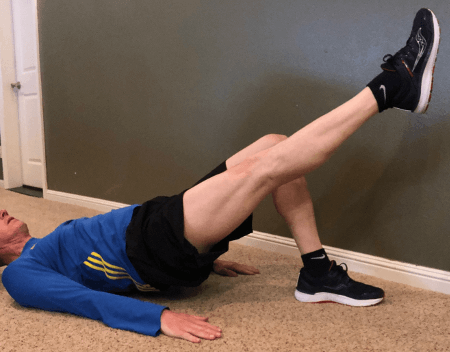 This exercise both shortens the calf muscle and then lengthens it. Including an eccentric (or negative) component adds value to the the calf. Performing exercises with an eccentric component actually shortens the time it takes to heal an injury. If you’re currently experiencing shin splints or they have plagued you in the past, incorporate the above routine into your training two to three times per week. Now you’ll be targeting the real cause of your shin pain rather than strengthening a muscle that really doesn’t contribute to the injury. Claude T Moorman III, ScientificAmerican.com/article/what-cause-shin-splints. May, 2004. Running Anatomy, Joe Puleo & Dr. Patrick Milroy, 2010 Human Kinetics. Last week, I presented a video and discussed the difference between shin splints and stress fractures. 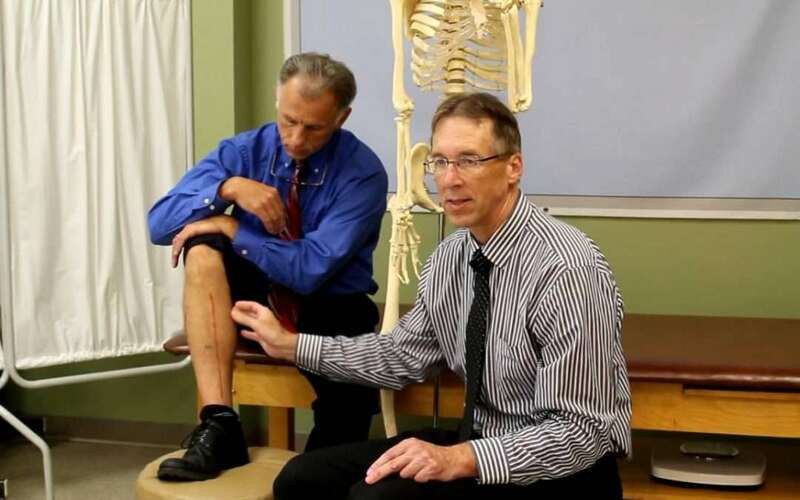 That video reviews in detail the differences, which is really important because the treatment is so different and it’s possible for shin splints to lead to a stress fracture if not treated properly. One of the root causes of shin splints is a muscle imbalance in leg with calf muscles being much stronger than muscles that surround the shin (tibia). Because these muscles are under developed with beginner runners and athletes like weight lifters who try to run, shin splints are very common. The following video provides 3 easy exercises that should be regularly completed to help prevent shin splints. 1) Avoid or at least minimize running on hard surfaces, instead opt for softer surfaces like crushed gravel or well worn dirt trails. 2) Run in shoes that aren’t worn down. The general rule of thumb is to replace running shoes between 350 – 500 miles. Take a look at the soles and if they’re showing signs of wear, replace your shoes. Even if the soles aren’t worn down, the inserts inside will be after about 350 – 500 (tops). 3) Give yourself enough time to recover from long and/or hard workouts. Go easy and try to stay on softer surfaces after putting a lot of stress on your legs. 4) Stay at a healthy weight. This will also help avoid or minimize many other running related injuries to the knees, hips, back, etc. The following video is a short view, but I’m sure you’ll find it to be very informative with exercises you can start doing immediately. Have you heard of training by feel, running with your inner GPS or simply training without a GPS watch? They’re basically the same, but I had never tried this strategy myself, until the last 5+ months. Last Sunday, I crossed the finish line of the Vancouver Lake Half Marathon and I saw the finishing time of my run for the first time since last September. In this article, I will briefly tell you what I learned, how I trained and the results of my race. Since 2010, I’ve religiously tracked every run that I completed outside. I uploaded runs to my Garmin Connect, Polar Flow or Strava Accounts. Prior to 2010, I used a simple digital stop watch (traditional Casio) and documented the results in a log book. I was never obsessed with my times, but I would compare similar workouts from year-to-year.The GPS watch was merely to ensure I was following the assigned workout paces. I wasn’t typically concerned about distances, since I’ve been running in/around my town for the last 19 years, I know the approximate distances. In Matt Fitzgerald’s book: RUN – the mind-body method of running by feel, he provides numerous reasons to ditch the gadgets and listen to our body. The biggest reason to run by feel, as opposed to increasing/decreasing your pace mid run, based on what you see on your GPS watch, is that how you feel during runs is the most reliable indicator of how well the training process is going. 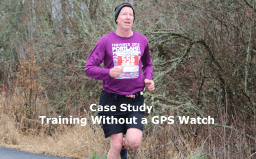 Many who run without a GPS watch claim that it reduces performance pressure and can help prevent injury, because when they make adjustments to their pace based on how they feel, they’re not over-extending themselves. Instead, they’re actually working within a smart, yet challenging, training zone. So, if you feel good during a run, you’re likely fit. In general, the more fit you are, the better you will typically feel during your runs. Now, I understand that if one was running slow, they may feel good, but that doesn’t mean that they’re fit. So, let’s assume you need to be running at what is a fairly quick pace (within your abilities) and then determine how you feel. Ultimately, the only way to get fit is to work hard, which likely means you’ll end up suffering through some workouts. Momentum in running, occurs primarily in training and can take the form of a period of improving fitness. In many articles and interviews, it’s apparent that even the most confident athletes know that they do not have complete control over every situation. They are aware that their success often depends on the situation shaping itself to their benefit. Why not remove the watch from the equation and simply run by feel where you can create both a positive mindset and momentum. 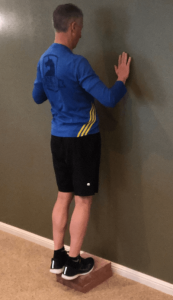 In my experience, with runners I coach, the most effective way to manage their fitness/fatigue balance is to tell them to pay attention to how they feel. When they don’t feel good, regardless of the time/pace on their watch, we must must determine whether it’s because of lack of fitness or excessive fatigue. If it’s lack of fitness, we can correct this with more hard work. However, excessive fatigue should be corrected by more rest, which also could mean simply slowing the pace of the workout and upcoming workouts. Another term for running by feel is “using your inner GPS.” Some coaches, like McMillan, have written extensively about calibrating your inner GPS, so I won’t get into the details in this post. It’s important to understand that inner GPS training or running by feel should not take the place of traditional time/distance-based training. At least not until you have a lot of experience running by feel. I recommend that if you want to run a time like 1hr 59 minutes for ½ marathon, you better know exactly that pace. If you don’t feel completely comfortable about ditching a gadget, an alternative to using a GPS watch is using a heart rate monitor. You’ll still need the watch, but you can just adjust it so you only see your heart rate. One could make a sound argument that this is technically running by feel. Instead of running at preassigned paces that you monitor with your watch, when you train with a heart rate monitor, you simply adjust your pace by keeping your heart rate within a specified zone. This is why this is also referred to as zone training. I discuss how to train using a heart rate monitor in an article I wrote a few years ago. What started out as just running my base/easy mileage without the watch, soon turned into 5+ months of not tracking my times or pacing for any training run. The majority of my runs were on the road, some were on hotel treadmills. Typically the treadmill runs were 4 – 5 miles at an easy/conversation pace (low 7s) and an elevation of 1.5 – 2 degrees. Duration of my treadmill runs were 30 – 40 minutes. Over the first 3 months I usually ran 18 – 30 miles per week at an easy or conversation pace. I don’t know for sure the pace of any runs, but for the last 5+ years, I’ve been able to easily complete 6 mile runs between 46 – 48 minutes. To a large extent, due to my many years of experience of being a long distance runner, my inner GPS has been calibrated. I’m confident that I was probably running the majority of my runs at 7:45 – 8:15/mile pace. As you can see below, I also completed a few faster/tempo paced runs of 5-6 miles. On a weekly basis I would also get to the track to complete strides to keep my legs moving faster. Since last September, while I completed my base or foundation training, I also performed 2 – 3 different CrossFit workouts per week. The CrossFit consisted of 45 minute High Intensity Interval Training (HIIT) with a variety of challenging body weight exercises. I also regularly completed a 45 minute routine where I would rotate between 1 minute on a stationary bike at a controlled to vigorous pace with 1 minute of body weight, BOSU and/or barbell exercises. The key to these workouts was the variety and intensity. They were supervised by a personal trainer in a group setting at my health club. My goal was to get stronger, build an injury resistant body and reduce the pounding on my legs while completing aerobic exercise. Two months out from the ½ marathon, I started to gradually increase my weekly long run from 7 to 12 miles. I also increased the intensity of 1-2 runs per week. All the while, I never used a GPS watch. Following are some of the workouts that I completed: Training started in September. During Weeks 1-4, I continued with base training (conversation pace runs of 4 – 7 miles) and cross-fit training. Because I didn’t train too hard for this race, I wasn’t sure what kind of time to expect. 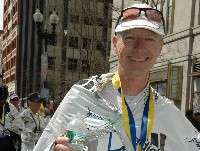 The last ½ marathon I completed (2 years ago) was 1:27:45. I figured anything around 1:30 (6:55/mile pace) would be great. 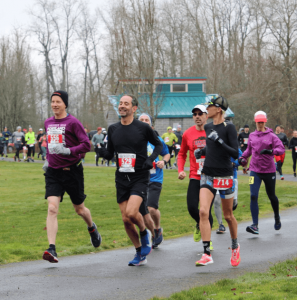 With almost ideal conditions of 35 degrees, overcast and no wind, I positioned myself at the start, slightly behind some runners who were projecting finish times of 1:25 – 1:28 (6:30 – 6:45/mile pace). My strategy wasn’t to try to keep up with the faster runners. Instead, I wanted to keep them within range (gradually let them get 3-4 minutes in front of me). Turns out, this is exactly how the race played out. There were no splits given at any point, so I only knew my time as I approached the finish. My finish time was 1:30:25. It really was liberating to train without a watch. However, I think I would use a watch for longer runs & track workouts if I was really concerned about achieving a goal time. The key to being successful when you’re not training with a watch is to be honest with yourself and push during the hard workouts and of course during the race. I knew I was getting fit when I was able to comfortably push the last 4.5 miles of my 9 mile run the Sunday before the race. Due to some tough weather in January, I condensed the timing of the strength & track workouts (typically they start 8 weeks out), I never worried about splits during any of these harder runs. My goal was to self calibrate what I thought were 5k, 10k, ½ and full Marathon paces during each of the tougher workouts. During each one I always felt like I could have gone further or completed another interval at the desired pace. This doesn’t mean that I wasn’t running fast enough, because I felt fatigued. I’m certain I could have run faster in the race if I had a 6 or 8 mile split. Also, if I included more strength and interval workouts in my schedule, I would have benefited. I also believe that if I had used a GPS watch during the race, I would have pushed the pace a bit more during the middle and end to get under 1:30. 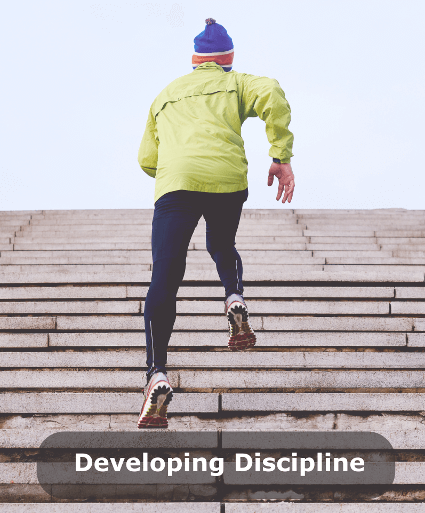 Developing more self discipline is an essential skill for those who are training for a marathon. Completing the race is an incredible achievement, but it’s the journey of training for 12-16+ weeks, that leads to a true sense of accomplishment. I’ve always believed that busy people get more done. However, the fact is that people with a higher degree of self discipline spend less time debating whether or not to indulge in activities and behaviors that prevent them from achieving their goals. For some people, simply being undisciplined can cause them mental anguish. Over the years, I’ve encountered numerous middle age athletes who successfully achieved their athletic goals because they had the discipline to follow a training plan, even while leading busy lives. I have also coached people who struggled to keep up with a plan because they admittedly had a hard time staying focused. 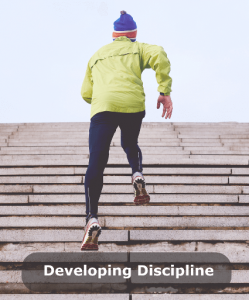 Developing more discipline takes time and effort, but there are numerous ways you can make this process easier for yourself. 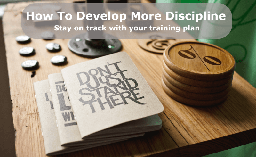 In this article, I’ll discuss a few tips that will assist you in becoming more disciplined, so you can achieve your goals. To start the process of getting more discipline, you need to recognize why you may lack discipline and what you stand to gain by gaining more discipline. You may be unhappy with your appearance and believe that training for and ultimately completing a race will help you lose weight and improve your health. Another motivation may come from the desire to “get back in the game” after a long layoff from regular exercise. Having clarity of purpose will help you with each of the next steps. Use a training schedule to prepare you for your race. If you work with a coach (which I strongly recommend), he or she can put together a have a schedule that fits your goals, athletic abilities and specific situation (like work and family commitments). The workouts should be laid out for you in a calendar format. Now all you need to do is plan at which time you will complete your daily training. If you are trying to follow a training plan, it’s essential that you plan your workouts. Just like you schedule appointments in your calendar, do the same with your workouts for the week. I like to plan the times and specifics of my workouts on Sunday. If I didn’t take the time to plan ahead, I would find dozens of excuses or other activities to take up my time. Years ago, when I was coming off of injuries that slowed me, I had convinced myself that I had become too busy to train for races. Now I simply work around important things like Church and family commitments. I don’t neglect these important activities, instead, I ensure that I also include time for exercise. If you want to improve something like your productivity at work so you don’t have the excuse that you’re too busy to exercise, try turning off social media notifications and silence your cell phone. Make a list of “to do’s” for each day and commit to minimizing distractions, so you can stay focused on accomplishing your goals. Just as important as committing to regular exercise is eating healthy. Another common weakness for many, including myself, is sweet and processed foods. I know that having these foods around becomes incredibly tempting when I’m hungry. Having the willpower to avoid unhealthy food is far easier when you are not surrounded by it. If you want to eat healthier, remove the junk food and soda from your house and don’t buy it when you’re in the store. Shop only from your list and only go grocery shopping after you’ve eaten, so you avoid the temptation to get food you don’t need. The bottomline is that you set yourself up for success by “ditching” bad influences. This strategy is where you say “I will spend a certain amount of time on this project.” For example, say to yourself “I will just do this for the next 15 minutes,” you may find that you actually get into the flow of what you are doing and end up spending a longer period of time on it and getting more done. The same thing goes for exercise. Just getting out the door for 20 – 25 minutes may be enough if you only have 30 free minutes. If you’re training for a race so you can be healthy or for a charity, don’t forget that you’re doing something not only for yourself, but as an example for your spouse, kids and others who might benefit. You cannot work all the time, or you will burn out very quickly. So be sure to schedule times where you have fun activities, or even just a half hour of relaxing. This gives you something to look forward to, and gives you a chance to recharge your batteries. This is especially important if your work requires a lot of creativity like writing, designing, and other such endeavors. Give yourself something to be excited about by planning a reward when you accomplish your goals. Just like when you were a little kid and got a treat for good behavior, having something to look forward to can give you the motivation to succeed. Also, recognize that failure can actually be a victory, because failure means you tried. Hopefully you learned something too, so you now know what doesn’t work. Next time, try something a bit different. This is why it’s important to practice your pre-race routine. Whether it’s in 10k or 1/2 marathon before your marathon or just a long run, find out what foods, drinks & gels work best for you. Form a support team by reaching out to the people around you, and asking for their help. It really helps to have a coach who understands your goals and specific situation. Don’t hesitate to ask for suggestions when you’re struggling to follow a plan. Another alternative is to work and discuss your challenges with a training partner or partners. Remember, that you’re not on an island by yourself. Develop and use your support team. I’m happy to help you. Please contact me if you’re having challenges staying or getting motivated to train for a race or to simply resume running.